Download the official BottleRock Napa Valley app and pick out your “must see” bands. Set a little schedule for yourself and don’t miss a thing! Get your first sip of summer at The JaMPad, opposite of the JaM Cellars Stage. Come by early, grab a glass of Butter and get ready to boogie with DJ Josh Duke’s Dance Party! It’s the perfect warm up to your day. Primp your inner Rock Goddess with some sweet merch before all the best styles sell out. Get glittered! Make your way over at the JaM Cellars Candy Cabana at the Midway Green to hang with Cali the Candy Unicorn, get sparkled by our amazing glitter artists, and take your chances in on our very Instagram-able glitter tornado! You have to see it to believe it! JaMSessions with Jayn from Alice Radio start early afternoon up until the headliners play. We’ll be getting up close and personal with artists like Michael Franti, The Struts, Alice Merton and more. Candy Frosé all day! Grab a frosty glass of Frosé to celebrate with us as we show off our latest release of California Candy Rosé in frozen form, only available at the JaMPad and the JaM Cellars Candy Cabana. When you need to refuel after busting out all those dance moves, head over to the Culinary Garden for bite to eat. (it’s cheat day, remember?) Treat yourself to lunch, a glass of JaM Cabernet and check out all the shenanigans on the Culinary Stage! Ready to dance again? Head over to the silent disco, put on a pair of headphones and shake that boo-tay! Don’t feel like dancing? Go over there anyway and watch… it’s hilarious. As the night starts to wind down, grab a glass of Butter and get settled in for your favorite headliner. Getting there early pays off to get as close as possible! Need some space? Come back to the JaMPad and watch the live stream on our 14 foot video wall! Ready to keep going? Head downtown and get your tickets to one of the official BottleRock AfterShows at the JaMCellars Ballroom. Whether it’s just for the day, or all weekend long, we can’t wait to JaM out with you for another year of rockin’ music and great wine. We can’t wait to JaM with you in Napa next week. We’ve done this festival thing a few times, and we don’t want you to forget a thing! Here are ten “must-haves” for an epic festival adventure. 1. Sunscreen. Pro-tip: Aerosol sunscreen is not allowed in to BottleRock (sorry, it’s the rules!) so we recommend grabbing our favorite All-Good Organic Sunscreen Butter to save you from the burn. 2. Rockin’ Outfits. Calling all our Festival fashionistas! We know you planned your outfits for the weekend to a tee. But if you get to town and feel like you could use a little extra shopping (who doesn’t?) then check out some of Napa’s local boutiques before the party begins to make sure you’re coming to BottleRock in style. 3. Beach Blanket / towel. We know you are going to be dancing ‘til you drop, so pack a Butter-yellow (so it’s easy to find) beach blanket or towel to make sure you have a place to crash in the grass when it’s time for a ButterBreak. 4. Stylish water bottle. When you’re not sipping on a refreshing California Candy Frosé from the JaMPad, stay super hydrated with a reusable water bottle like this one. 5. The BottleRock App locked and loaded. Skip the wait on the download time and make sure you have the BottleRock App ready to go before you arrive. This way, you won’t miss a thing and you’ll know exactly when to stop by the JaMPad and JaM Cellars Stage to check out your favorite artists! 6. Go Cashless. You can use Apple Pay just about everywhere at the festival. Save some time, set it up pre-fest, and use the Fast Lines to skip the lines! 7. A little bit of shade. Trends come and go (we see you, flower crowns) but a chic hat will always have you covered. Cheeky baseball cap? Classic Fedora? Find your style and enjoy that extra bit of shade when you’re JaMming out mid-day. 8. Ear plugs. After a long day listening to great tunes, you might need to give your ears a little break. Especially after you rocked out next to the speakers at that last JaMSession. Pack a pair of ear plugs to keep on hand, just in case. You don’t have to sacrifice style (ever) so channel your inner Holly Golightly with ear plugs like these. 9. Fanny pack. Can we officially bring the fanny pack “back”? Forget dragging your purse all over the festival, keep your essentials in a super cute holographic fanny pack like this one. Why be boring when you can be unicorn colored? 10. Forget Something? Don’t sweat it. BottleRock has three general stores on site to cover your slip-up. They’ll have things like gum, lip balm, over-the-counter meds, yada yada yada. Thanks for thinking of everything, BottleRock! 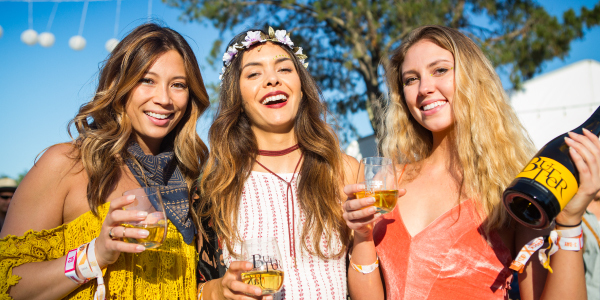 We can’t wait to raise a glass of Butter to another BottleRock season with you. We’ll catch you at the JaMPad, or the JaM Cellars Tent! Visions of California Candy ran wild when we dreamt up the JaM Cellars Candy Cabana! Come with us on a magical journey with a mini-escape inside a magical wonderland filled with rainbows, glitter, and did we mention a unicorn? It’s just as amazing as it sounds, and we’re crafting it just for this special weekend! When life gives us BottleRock, we bring the glitter! 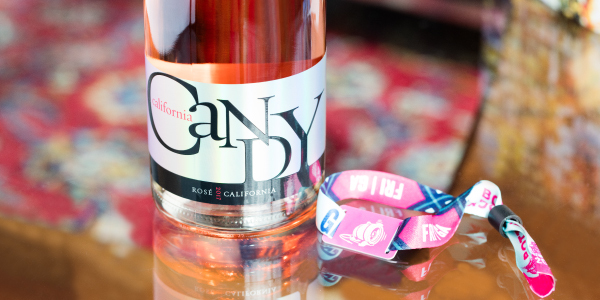 We are ready to bling you out at the Candy Cabana where you can rosé and frosé all day with JaM’s newest wine Candy – it’s as pretty as it is delicious. With our Glitter Artists, we’ll give you a little extra sparkle to rock, and get lucky in our glitter tornado to win some fun prizes! And catch a rare snap with Cali the Candy Unicorn! Yes, yes you Can-dy! Watch the glittery magic unfold and get ready to share this fabulousness on Instagram using #CaliforniaCandy and #BottleRock! Can’t make it to BottleRock this year or missed out on the JaM ticket giveaway? We’ll totally miss you. But you don’t have to feel like you’re on the out. 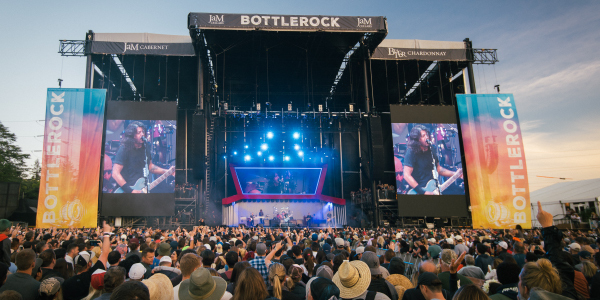 Make Memorial weekend memorable and host BottleRock in your backyard! Summer is officially here and that’s the perfect reason to party. Tell everyone to grab a few bottles of Butter and come on over…we’ve got your recipe for your very own BottleRock party! Assign everyone a Chef from the Culinary Stage, and have them bring their favorite recipe. You’ll need snacks to keep you going all day long! Did someone say sticky ribs? Get your lip-sync game strong and plug in to the official BottleRock 2018 lineup playlist. Scroll through Instagram and keep tabs on all the fun going on through #JaMPad and #JaMCellars for more party inspo. We’ll also be on Facebook Live for sneak peeks in between sets and more! 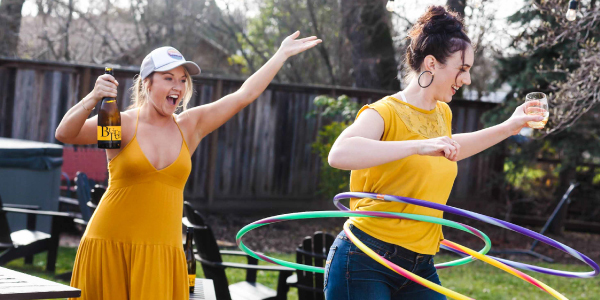 If you need more tips on throwing the best party ever, check out how BlueGrayGal threw her very own Butter Weekend in her backyard. We are big fans of super easy get-togethers, so keep it low key and give everyone a job to make hosting a breeze. We know your dance moves get better a little Butter, so make sure you chill down a few extra bottles and throw in a bottle or two of Toast to get the party started. Maybe we’ll see you next year? Or maybe your Backyard Bottlerock will be so epic we’ll be coming to your house instead! 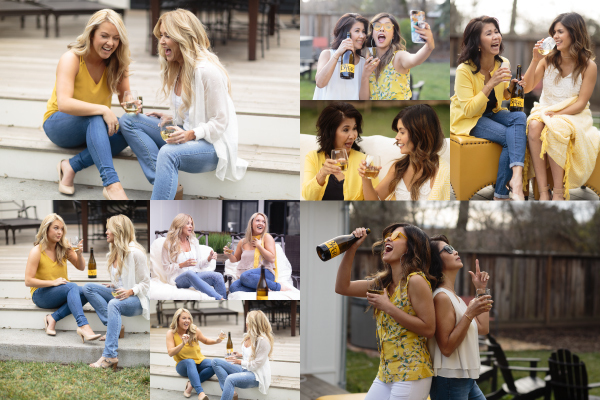 For this Mother’s Day our heart-strings were pulled and our bellies hurt from laughing when Leah and Cheyenne spent a day with their Moms Bella and Angela, Butter Chardonnay, and some extraordinary questions. We learned some truths that are important to remember, even if only one day a year. - The special bond between Mom and daughter needs its own space and time. Making time is hard—but soooo worth it. Time over wine makes for a wonderful invitation. - Putting yourself in each other’s shoes is both enlightening and down-right hilarious. - Laughter, tears and Butter flows when memories are being shared and made. - Once you see each other as adults, it opens up a whole new world of fun, friendship and new traditions…did someone say “mooning”? So, for all the beautiful Moms, Daughters and ButterLovers out there…grab each other, two glasses, a couple of hours and a bottle of Butter Chardonnay (here) to Spread the Love this #MothersDay. Be sure to tag us in the Mom & Daughter selfies using @JaMCellars and #SpreadtheLove!